Southwestern Twice Baked Potatoes taste like a plate of nachos crashed into creamy mashed potatoes. The perfect make-ahead dinner, lunch or side dish! Even the most promising of weeks can turn into a grind. Work, dentist appointments, go here, pick up this and Oh Yeah now it’s time to make dinner! 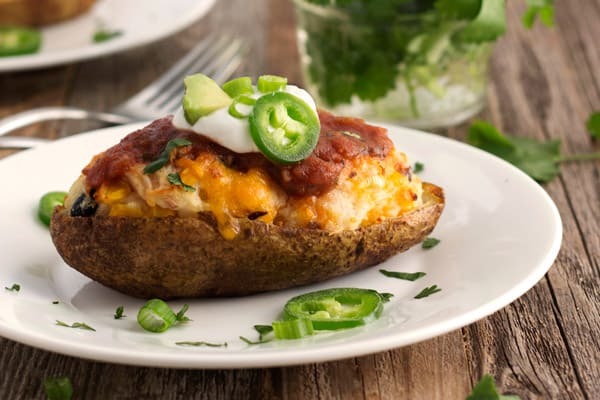 That’s why filling your fridge with a few creamy, cheesy Southwestern Twice Baked Potatoes is never a bad idea. They’ve got all of your favorite Tex-Mex flavors packed into a crispy potato shell. In our house, nothing beats an old-fashioned fluffy toaster oven baked potato for dinner. Well…maybe it’s a tie with these addictive roasted sweet potato rounds, roasted baby potatoes and chickpea salad or a batch of Everything Bagel style toaster oven baked potato wedges…it’s too hard to pick just one! They’re the ultimate in budget-friendly comfort food and so easy to cook. If you’ve never baked a potato in your toaster oven the method is the same as using a standard oven. We like to rub our potatoes with a little oil before baking to get the skin super crispy. Is It Faster To Bake Potatoes In A Toaster Oven? Not really, but it is BETTER. 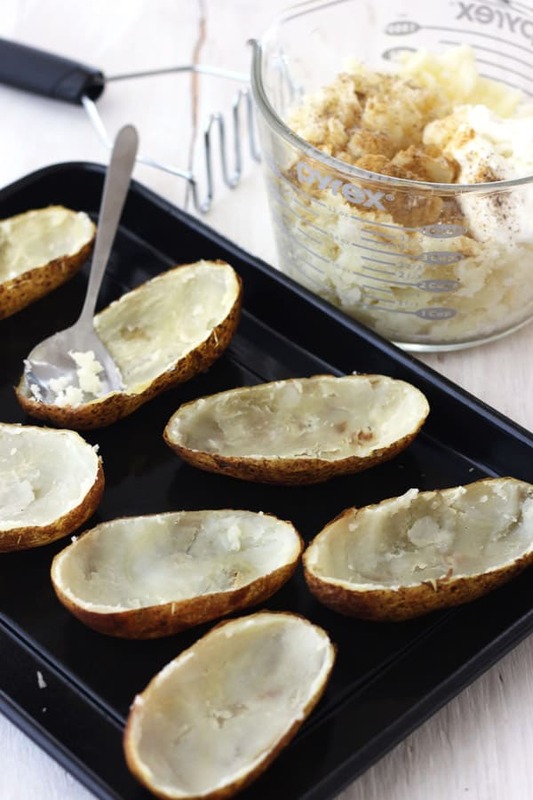 Your toaster oven will preheat a little quicker, use less electricity and is the only sane way to cook a baked potato during the summer months. Plus it’s fantastic for the “twice-baked” portion of this recipe. 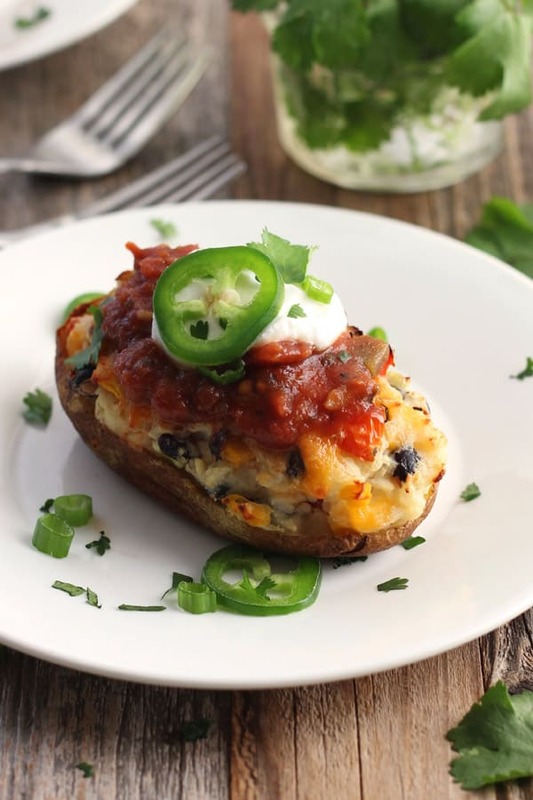 Because once you’ve made the filling and assembled your stuffed potatoes what’s next is up to you. Finish cooking them now, or save them in the fridge for later? 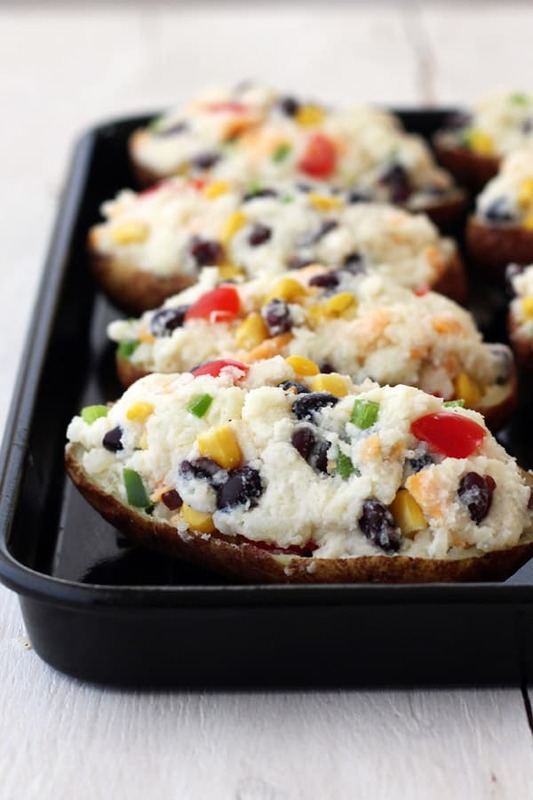 Tim loves to take these vegetarian twice baked potatoes for lunch. Just 15 minutes in the office toaster oven and he’s got a warm and satisfying meal. The first time he made them, THREE of his coworkers popped by to find out what smelled so good! You can use Greek yogurt, sour cream or ricotta cheese to make the filling. Substitute whatever veggies and beans you have on hand, kidney beans taste great. And don’t forget the toppings! 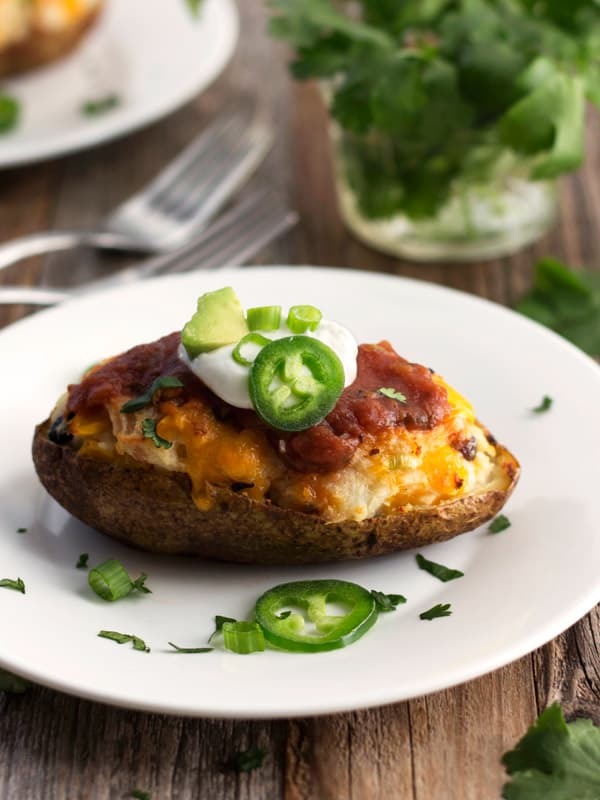 We also shared this Southwestern Twice Baked Potatoes Recipe on Food Fanatic, stop by to print out the recipe! Swoon. This is everything and anything I could want in a potato and then some. LOVE the southwest kick! Thank you, Karly! Love your #potatopassion 🙂 I’ll trade you some for a batch of your cinnamon sugar Chex mix!